Harley Bennell has played just two games for the Fremantle Dockers. TROUBLED Fremantle midfielder Harley Bennell's future hangs in the balance after another alcohol-fuelled indiscretion. Bennell was reportedly asked to leave a Cottesloe hotel on Sunday for being too intoxicated. Fremantle confirmed the incident, which occurred at the Ocean Beach Hotel just after 7pm. 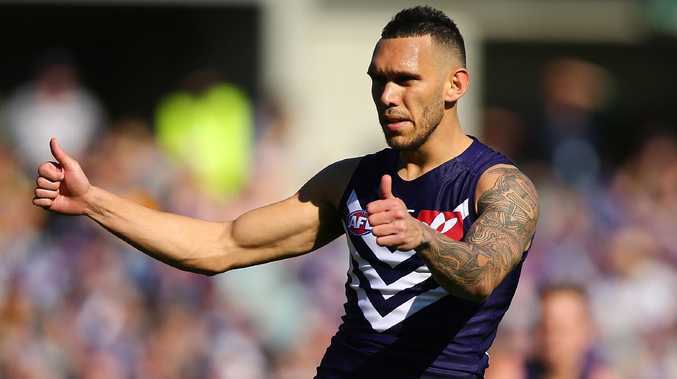 "The club is aware that Harley Bennell was asked to leave a licensed venue in Cottesloe on Sunday and complied with the request to do so," Dockers general manager of football Peter Bell said. The 26 year-old is due to return to training on January 7. Bennell has played just two games since joining the Dockers in 2015 due to a series of calf setbacks. The ex-Gold Coast Suns speedster has a rich history of nightclub antics. He was fined $10,000 last year by the Dockers after vision emerged of Bennell at a Fremantle nightclub hours before he was due to report for training. Bennell was kicked off a Virgin flight in 2017 for being intoxicated. He was fined by the Suns for disorderly conduct in 2013 and made front page news around the country in 2015 after being pictured with a white substance. The former No.2 draft pick was given a one-year contract in August. Bennell's manager Colin Young said in October his client had met with Bell and knew the club's expectations. "Harley knows exactly what he needs to do next year to get back to (being) an elite player," Young said. "I think Peter was just reinforcing (Bennell) that if he has one hiccup, he'll be out of the club. Basically that's the truth of the matter."